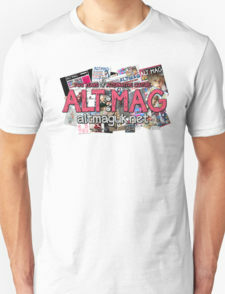 Sunday was a day of sadness for myself and many of my Alt:Mag buddies. No, no one we know died or anything, neither did any of us lose a large sum of money. If I could summarise this sadness in a Twitter hashtag, it would be '#NerdProblems'. So you want to know why we (well, me specifically, but I just wanted to hide behind a group in order to not look like a massive saddo) are sad? 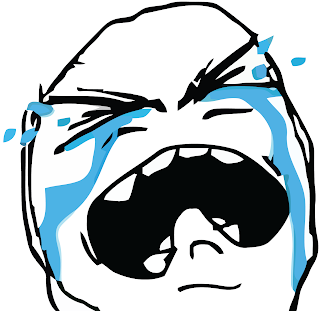 Prepare yourself, it is just too sad. Our local bowling alley got rid of their OutRun 2 arcade machine. Why did they have to do such a thing? It was well loved and we played it frequently. In fact, we played it so much that we could get all the way to the end of the game without running out of time. Three of the Alt:Mag team got high scores on that machine. It meant a lot to us. Also on a related note, Haydn still can't forgive the same bowling alley for getting rid of the Big Buck Hunter machine. Despicable. 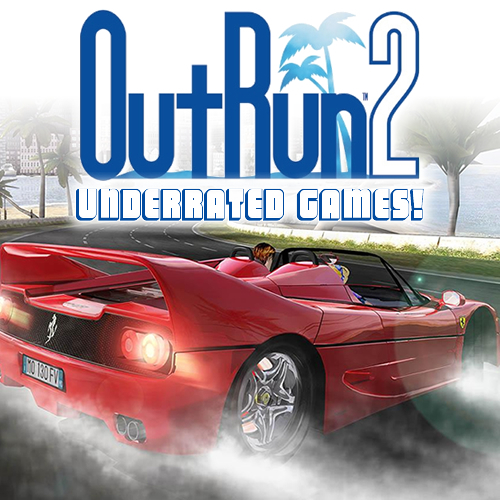 Anyway, this tragic loss made me realise that I should write an Underrated Games post about OutRun 2 because I personally believe it is criminally underrated. Produced by gaming hero Yu Suzuki (Shenmue, Virtua Fighter, Space Harrier, After Burner, Hang-On etc. 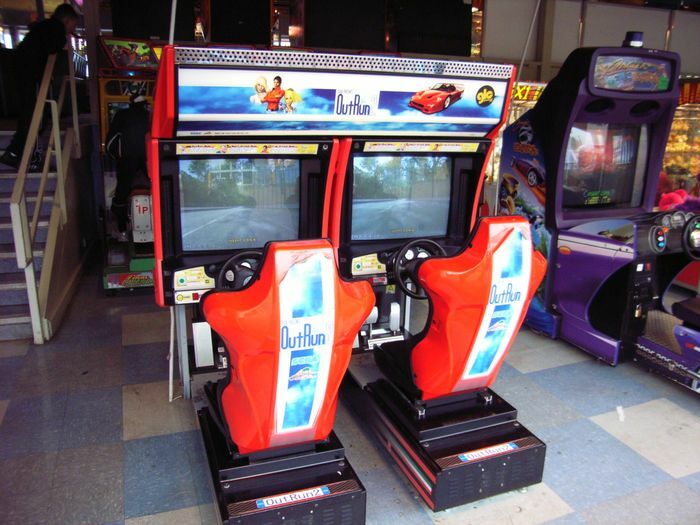 ), OutRun 2 is an arcade game you may have seen before in certain public places (usually Bowling Alleys in the UK), you might have even played it. It is quite hard to beat the game at first, but if you practice enough (we had a lot of pound coins) it becomes a fairly easy arcade game to complete, and every time you do so, it feels so damn satisfying. 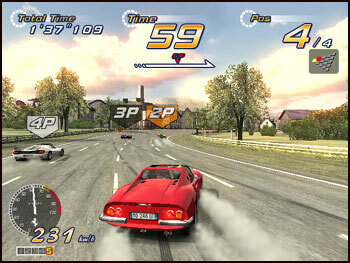 There are three modes you can chose from, OutRun mode, Heart Attack mode and Time Attack mode. Also, if multiple players pay at the same time, you can do a Vs. version of the OutRun mode, which is my personal favourite. The way the game works is, you race through courses that are laid out and linked in a branching triangle format, avoiding traffic and drifting your way around courses. After every course you can go right or left, selecting your route. Each game will take you down 5 courses in total (most of these courses have themed environments and are based on real life places in the world). When you enter a new course through a checkpoint, time is added onto your timer. If you run out of time the game ends. So to get all the way to the end of the game and win, you must keep a keen eye on the timer and be sure not to crash. The Heart Attack mode is simply the OutRun mode but it works differently. You continue to try and get to the end of the 5 routes, however you are set tasks by your bossy virtual girlfriend who is sitting in the passenger seat of your car. These tasks generate hearts, which lead to a high score. Tasks include drifting a lot, driving through cones, mowing down cute ghosts etc. The Time Attack mode is basically the OutRun mode again, except there is no traffic and you are aiming to beat the high scorer's best time or get a decent enough time to end up on the high score board. Me and my friends all managed to get high scores through this method. 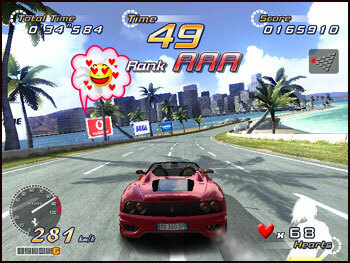 High scores are only achieved by getting all the way to the end of the course. 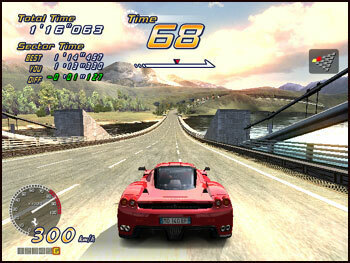 Music and cars (which are all of the sleek Ferrari variety) are selected before you are taken into the game. The music is just plain awesome. Every track is very Sonic-esque, and many stand out in particular, such as Splash Wave and Risky Ride. Every song sets the mood for a fun, competitive, sunny ride through ever-changing scenery. It is truly an arcade game that wants us to live a very awesome fantasy indeed. What is it about the game that stands out to me though? Well apart from being fun, rewarding and overall a well designed game, it is a game on a big list of games that I highly rate due to the fact that they bring people together. Playing this against a friend with a load of friends watching is something I have always found so fun to pass the time. Not much gets better than this. The game has been ported onto several consoles, but let's face it, the arcade machine version will always be the best, most immersive and most fun way to play what is an absolute masterpiece of a racing game.